On May 19, 1906 Olympic athlete-turned-actor Herman Brix—also known as Bruce Bennett, the adopted name he used for most of his professional life—was born in Tacoma, Washington. Most film fans probably remember Bennett for his roles in such classic “A” movies as Mildred Pierce (1945), The Man I Love (1947, his personal favorite), and The Treasure of the Sierra Madre (1948). Serial aficionados, however, revere the classic chapter plays in which he starred or co-starred as Brix: The New Adventures of Tarzan (1935), Shadow of Chinatown (1936), The Lone Ranger, The Fighting Devil Dogs, Hawk of the Wilderness (all 1938), and Daredevils of the Red Circle (1939). I was supposed to visit and interview Brix in October 2002, at the tail end of a week-long stay in Los Angeles. Unfortunately, he got food poisoning the day before our scheduled visit and, unable to postpone my flight back east, I missed my chance. However, I prepared a list of questions and gave them to the friend who had offered to videotape the event; subsequently he conducted the interview for me, getting nearly two hours of footage of the 96-year-old actor. I was primarily interested in writing the definitive article on New Adventures of Tarzan, and my questions elicited many then-unreported facts about the making of that 1935 serial. The article first appeared in Blood ‘n’ Thunder #5 (Summer 2003, long out of print) and was later included in Blood ‘n’ Thunder’s Cliffhanger Classics. For the Summer 2006 all-serial issue of BnT (also out of print) I distilled Brix’s few comments on his other serials into a brief article titled “Happy Hundredth, Herman!”, a reference to his recent centennial. To celebrate what would be the star’s 109th birthday I reprint those comments below. 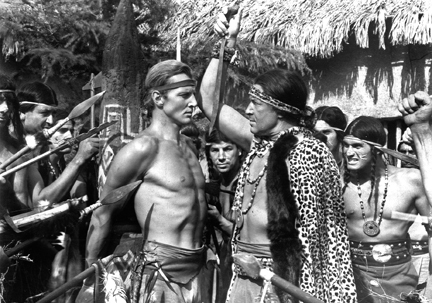 Brix fighting off Guatemalan natives in NEW ADVENTURES OF TARZAN. On Shadow of Chinatown, his second serial and first film after playing Tarzan: I was taken by my agent to see [the serial’s producer] Sam Katzman, who wanted a leading man to play opposite Bela Lugosi. He hired me right away. I don’t remember waiting to be told I had gotten the part. Now, Bela was paid a considerable sum of money—I couldn’t tell you exactly how much—and he was on the set for one and a half days, total. That’s it. Shot all his scenes for a 15-chapter serial in one and a half days. (Editor’s Note: We find this very difficult to believe, given the amount of footage Lugosi has in Shadow. We’re more inclined to believe that he only worked a day and a half with Brix, who was in most scenes and therefore needed to be around for the entire shooting schedule.) That film was made in the days just before the Screen Actors Guild [instituted regulations governing overtime pay for actors]. Several times, I worked 12-hour, 14-hour days and just slept on a cot in the back of the studio. I wouldn’t go home for two or three days at a stretch. Bela was a nice guy. He and his wife had my wife and I out to his place for dinner one night when we finished shooting early. He told me he couldn’t understand how I could do all the things I did, the physical stuff as well as the acting, on that kind of schedule. “All those scenes in one day!” He was very professional, but I thought he had a strange sort of idea of acting. He learned all the lines, but he said them in his certain way and that was it. Frankly, I never understood why people wanted to see him [in movies]. But he had that peculiar quality of mystery about him that made him good for that kind of part. 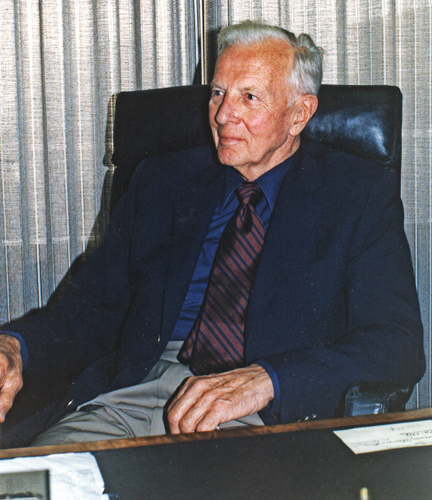 Sam Katzman . . . well, at that phase of his career he gave the impression of being just a happy-go-lucky guy who hoped everything would turn out all right. But, boy, he sure watched the pennies. If he could save a few hundred dollars by having two crews work 12-hour shifts instead of paying one crew overtime, that’s the way he would do it. He was pretty clever at figuring out the most economical way of doing a picture. 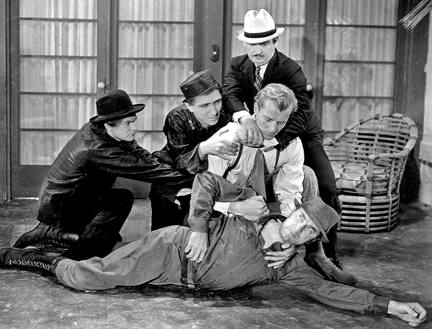 Brix has his hands on Bela Lugosi, whose henchmen intervene in SHADOW OF CHINATOWN. On making his first serial for Republic, The Lone Ranger: That was a lot of fun. We shot most of the exteriors up in Lone Pine. We did lots of shots riding back and forth, here and there, with those mountains in the background. I remember they assigned me a horse named Blackjack. Now, he had a tough mouth. You really had to jerk the reins back hard to get him to respond. One day I was doing an insert shot, a running insert, and Blackjack got the bit in his teeth and wouldn’t stop. He jumped up on top of a boulder—I swear, it looked as big as a house to me—and I fell off backward, and he fell down as well. And that was the last day I rode Blackjack. On making The Fighting Devil Dogs with his Lone Ranger co-star, Lee Powell, and director William Witney, who shared the megaphone with John English: I liked Lee a lot. We got to be pretty good friends and we did another serial together after The Lone Ranger. It was The Fighting Devil Dogs. We played Marines. I don’t remember too much about it, except that it had a lot of stock shots. The scenes were built around stock footage. But Lee and I had a lot of fun with it. There was a lot of action, a lot of fighting, as I recall. But, you know, when you’re young and active and in good health, you do the damnedest things that you otherwise wouldn’t do. During World War II, Lee was called up and went overseas. He was shot down not long after he got there. I was very unhappy to hear that he had died. I remember Billy Witney being an energetic, clever young director. On the set, he acted like, “Alright, I don’t care, do it that way.” But he always knew what he was doing. And everybody felt that way [about him]. 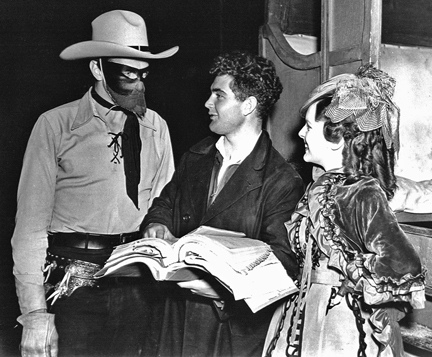 Between scenes of THE LONE RANGER: Brix, behind the mask, with co-director Bill Witney and leading lady Lynn Roberts. On making his only solo starring serial for Republic, Hawk of the Wilderness: That was fun to make. And I believe it was a fairly successful picture of that type for Republic. I can tell you what I remember most about that one. At the end of the shooting schedule, there were still a number of scenes—maybe 15 pages of script—that hadn’t been shot. Scenes with the Hawk doing things alone, running, climbing, and other things. This stuff hadn’t been shot when the production originally shut down. So [the producer] had me come back and we went up to the location, just me and a camera crew. Well, we shot one whole day, that night, and into the next day—without stopping. Now, by that time the SAG regulations were [being enforced], and I was on triple overtime. I got more money for those two long days and one night than I got for the whole film! As “Kioga,” Brix is at the mercy of “Yellow Weasel” (Monte Blue) in HAWK OF THE WILDERNESS. I love your posts about the old serials and people who made them. I am not familiar with Blood ‘n’ Thunder’s Cliffhanger Classics, can you please tell me a little more about it? Jim, Cliffhanger Classics is a book-length collection of essays on serials that appeared in the first couple dozen issues of Blood ‘n’ Thunder. You can find out more about it by clicking on the title link in the post above.